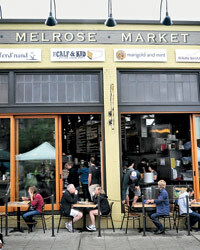 The indie food vendors at Seattle's new Melrose Market belong to a mutual admiration society. The result: some delicious collaborations. I am having lunch with my friend Katherine Anderson behind the counter at her flower shop, Marigold and Mint, in Seattle’s new Melrose Market. The tiny store is filled with ivory hydrangeas and ranunculus offset by conifer branches; puffball tumbleweeds from eastern Washington balance on the rafters above us. Katherine loves combining ornamental and edible plants, so her arrangements include things like tasseled purple amaranth, wee white strawberry blossoms and herbs of all kinds. It can be hard to tell where the flowers end and the groceries begin. 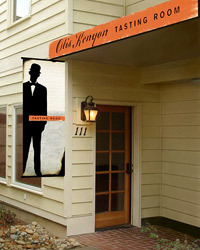 That helps explain why chef Matthew Dillon is one of Marigold and Mint’s regular customers. The owner of Sitka & Spruce next door (and an F&W Best New Chef 2007), he’ll stop in to pick up nettles to use in a sauce for brined salmon, or bottle-blue borage blossoms to top sautéed cucumbers. "He’ll grab a bunch, tease my sister, who sometimes works here, and rush back to his kitchen," Katherine says. Led by Dillon, who adds a dash of punk urbanity to his lyric pastoral cuisine, the citizens of the market stand firm in their shared devotion to all things artisanal, whether imported or, as is often the case, local. Katherine, for instance, grows many of the flowers and herbs she sells in her shop. She got her professional start as a Harvard-trained landscape architect; in 2008, she defied the idea that "landscape architects hate flowers," as she jokes, by launching Marigold and Mint Farm in Snoqualmie Valley. 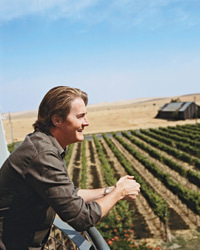 The property is also home to Oxbow Farm, founded by Katherine’s father, the venture capitalist Tom Alberg. Oxbow raises organic fruits and vegetables for farmers’ markets and restaurants in the Seattle area (including Sitka & Spruce), and Katherine sells Oxbow produce at Marigold and Mint. Ayako Yoshikawa-Gordon doesn’t own a shop, but she is a Melrose Market fixture. A petite, elegant woman clad in dark layers of Japanese clothing, she acts like a buzzing bee cross-pollinating the stores with her creativity. "The market is very alive. It reminds me of Tokyo, where I’m from," she says. A longtime friend of Dillon’s, she creates floral arrangements for Sitka & Spruce. When she started buying flowers from Marigold and Mint, Katherine hired her to help with arrangements, too. And once Katherine tasted Yoshikawa-Gordon’s homemade heirloom plum jam, she started to sell it. "It’s the kind of jam that you want to maybe not share with your weekend guests," she says. On Mondays, Flint makes space in his butcher’s case for boxes of Yoshikawa-Gordon’s handmade dumplingsfilled, of course, with Rain Shadow pork and vegetables from Oxbow Farm. As Yoshikawa-Gordon hands out samples on beautiful plates, customers sometimes comment on the pottery. They learn it’s from a local ceramicist and sold, naturally, at Marigold and Mint. Vendors at Melrose Market are still finding new ways to collaborate. Dillon and Katherine, who share a fondness for slightly unruly beauty, are planning a ramble through the forest near her farm in search of undomesticated decorations and edibles. What gets eaten and what gets put into a vase is yet to be decided, but the market will surely find a home for their haul. Sara Dickerman is a food writer and former restaurant cook who writes often for Slate and the New York Times. She lives in Seattle and blogs at saradickerman.com. Owner Katherine Anderson sells bouquets (like this one with geranium and parrot tulips), plus herbs, produce and artisanal goods like ceramics. Chef Matthew Dillon uses edible blossoms and herbs in his cooking at Sitka & Spruce restaurant and Bar Ferd’nandsprinkling tangerine marigolds on an appetizer of raw fish, for instance, and adding dill to a green sauce for anchovies. Cheesemonger Sheri LaVigne offers public tastings of her French triple crèmes and cheeses from super-small, local producers like farmstead tomme from Yarmuth. Owners Brad Gillis (left) and Ben Friedman, with chef Rob Milliron, make sandwiches using only local, sustainable ingredients. The menu changes seasonally. Melrose Market vendors receive a discount. At Marigold and Mint, Katherine Anderson transforms flowers from her farm into striking arrangements. Photo © Theo Morrison. Marigold and Mint sells both edible and decorative kinds of greenery. Photo © Theo Morrison. White andromeda clusters form the base of this unstructured arrangement. Photo © Theo Morrison. Frosty dusty miller leaves and white pincushion flowers get a jolt of color from purple hyacinth. Photo © Theo Morrison. A simple mason jar gives a loose bunch of tulips and daffodils a just-picked look. Photo © Theo Morrison. Unripe blackberries add texture to pink and violet ranunculus and white tulips. Photo © Theo Morrison. Tiny daffodils echo the colors of pale yellow ranunculus and white pincushion flowers.